Ancient peoples had a more vivid view of the night sky than we have. Our forebearers created colorful mythologies to explain the light shows known as Auroras, but we hemispherically-centric people in the northern hemisphere call the Northern Lights. Northern Lights over Lyngen fjord, March 2012. Auroras occur because of solar winds. Solar winds are highly charged electrons blown from the Sun toward the Earth. Streams of charged particles, called plasma, escape the Sun's gravity because of their high energy (1.5 to 10 KeV). Solar winds flow at supersonic speeds outward from the Sun covering great distances and creating geomagnetic storms in the Earth's magnetosphere. 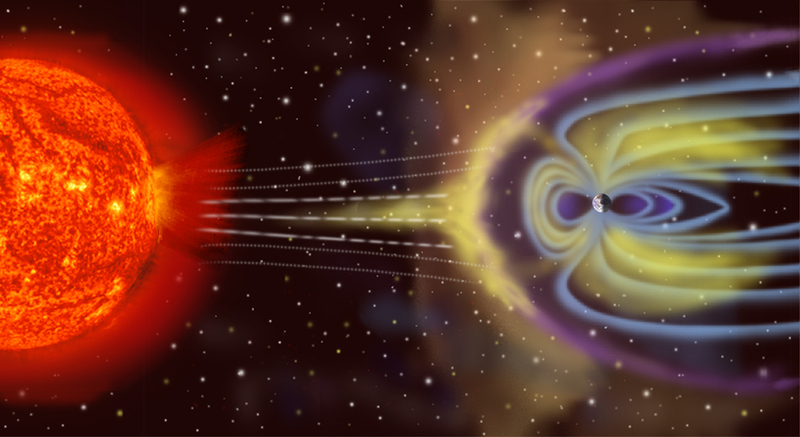 Depiction of solar wind particles interacting with Earth's magnetosphere. When the highly charged electrons enter the Earth's upper atmosphere they encounter oxygen and nitrogen at various altitudes. Color in Northern Lights is determined by whether oxygen or nitrogen atoms are struck first and at what altitude. Shifting combinations of charged particles encountering atmospheric gases at various altitudes make the Northern Lights undulate and dance in the night sky. Northern Lights Mythology & Science, GrokEarth, 24 March 2012.